"I felt hurt on opening my wardrobe and seeing my uniform, school bag and geometry box. Boys' schools are opening tomorrow. 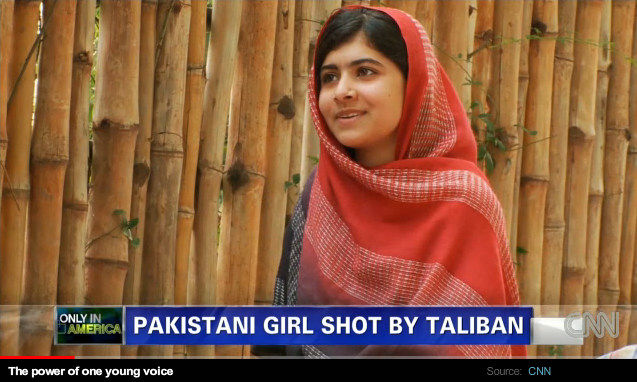 But the Taliban have banned girls' education." On Tuesday, October 9, 2012, Taliban militants attacked and seriously injured Malala Yousafzai, a fourteen-year-old campaigner for education for girls in Mingora, a town in Swat Valley, in Pakistan’s North Western Frontier Province. Miss Yousafzai was returning home from school in the north-western Swat district when gunmen stopped her vehicle and shot her in the head and the chest. The Pakistan Taliban said they carried out the attack, which was condemned both within Pakistan and worldwide. 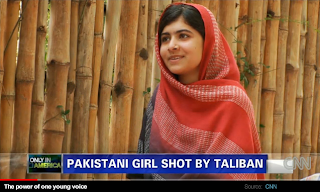 News agencies report that surgery to remove the bullet in Malala's head was successfully completed in Peshawar. She has been taken to the Armed Forces Institute of Cardiology in Rawalpindi for further treatment and is expected to fully recover. President Asif Ali Zardari said the attack would not shake Pakistan's resolve to fight Islamist militants or the government's determination to support women's education. Army chief Gen Ashfaq Parvez Kayani visited Malala in hospital on Wednesday and said the Taliban had "failed to grasp that she is not only an individual, but an icon of courage". Thousands of people around the world have sent the teenage campaigner messages of support via social media, #LetterToMalala and #Malala on Twitter. As stated in the New Yorker, a Pakistani Taliban spokesman has claimed responsibility and threatened to attack her again, if she survives: "She was pro-West, she was speaking against the Taliban and she was calling President Obama her idol." He added, "She was young but she was promoting Western culture in Pashtun areas." The National Peace Prize winner rose to prominence when her diary on life under the Taliban threat was published by BBC Urdu in 2009. The very first state proclamation drafted by a group of middle school girls has already been approved by Gov. Martin O’Malley of Maryland. This proclamation will be part of the celebration already set for Saturday, October 13 at the Maryland Women’s Heritage Center with lots of interactive activities about Title IX, STEM as well as global gender justice issues like ending child marriage.